Tenova TAKRAF Italy has been awarded a contract by ILVA S.p.A., the leading Italian steel producer, for the design and supply of a bucket-chain continuous ship-unloader (CSU) for handling iron ore and coal at the ILVA steel plant in Taranto, Italy. This plant is the largest of its kind in Europe. The 18-month turnkey contract builds on a long-standing business association between Tenova TAKRAF and ILVA of over 40 years. The new CSU will have an operating capacity of 4,000tph (tonnes per hour) for iron ore or 2,240tph for coal and will be able to download vessels up to 150,000dwt (deadweight tonnage). The CSU will be erected on the existing runways of the ILVA plant’s Pier II to feed the entire steel plant with coal and iron ore and pellets, together with the other machines at the plant. The CSU will be almost entirely manufactured by Italian companies and is expected to be operational in late March 2015. In addition to the long-standing and much-valued relationship with the client and competitive pricing, availability of this technology was a major factor in the award. Only a few companies in the world are able to supply this type of technology and Tenova TAKRAF offers many successful references. To date, 15 CSUs have been supplied worldwide, with relevant references to the lLVA award being excellent performances achieved by four CSUs recently supplied to Enel for Brindisi South and Torrevaldaliga North, in Italy. Tenova TAKRAF developed its bucket chain CSU technology in the 1980s. Subsequent years have seen ongoing enhancement to the technology, with the most sophisticated part being the digging foot, for which Tenova TAKRAF holds the patent. Following the devastating tornado of November 2012, ILVA initiated a plan for environmental rehabilitation of the steel industry in Taranto. The new CSU was ordered as a consequence of this. The plan involves replacement of the old grab ship-unloaders (supplied in the 1970s under the Italimpianti trademark) with modern bucket chain CSUs, which significantly reduce dust emission during the discharge cycle. The CSU’s low environmental impact is a major feature, noting that the steel plant is close to the city area. In this brownfield project, the CSU is replacing the existing old grab unloaders at Pier II. Tenova TAKRAF also supplied a CSU for Pier IV in 1999, and an additional large grab unloader for the same Pier in 2009. Tenova TAKRAF is a key supplier of equipment and systems for open pit mining & underground solutions and bulk handling, having provided hundreds of complete systems, as well as individual machines to clients all over the world in all climatic conditions. Leading-edge comminution systems for milling and crushing requirements in mining and mineral processing are based on a track record in mill supply dating back to the 1920s. Globally sourced air pollution control, specialized handling equipment, and technology for the cement and fly ash industries ensure selection of optimal processing options. Bühler is a specialist and technology partner for plant, equipment, and services for processing basic foods and for manufacturing advanced materials. The group holds leading market positions worldwide in technologies and processes for transforming grain into flour and feeds, making pasta and chocolate, as well as in the field of aluminium die casting. The Bühler Group operates in over 140 countries, has a global payroll of over 10,000, and in fiscal 2013 generated sales revenues (turnover) of CHF 2,322 million. The core technologies of the group are in the field of mechanical and thermal process engineering. With its expertise and over 150 years of experience, Bühler time and again rolls out unique and innovative solutions for its customers, helping them achieve success in the marketplace. Bühler unloaders offer their operators great versatility in their applications: whether mobile or stationary, equipped with their own energy supply or supplied with electric power from the outside — they are sized to suit the different needs and can be tailored to the local conditions. The material is typically transferred to conveying systems which are permanently installed on the pier or directly to road or rail vehicles. Bühler’s mechanical and continuous shipunloader gives to the operator the most efficient and most economical solution for the steady increase of unloading capacities and volumes. Energy efficiency, lowest maintenance and operating costs are the key benefits for the customer. These are only made possible by the unique and proven mechanical chain conveyor technology. It satisfies all the requirements for achieving efficient and trouble- free materials handling. The enclosed, sturdy conveyors of rain- proof and dust-tight design enable vessels of sizes up to 120,000dwt to be unloaded at throughput rates as high as 1,400tph (metric tonnes per hour), depending on the specific class of ship. Demands on high-capacity ship-unloaders are ever increasing, due to the increasing commodity trade and the need for grain terminals to minimize energy costs and offer efficient operation. Bühler has noticed this long term trend and offers a complete portfolio of mechanical unloaders. The mechanical unloaders of Bühler can primarily handle free flowing products such as grains, but also food products like soymeal for example. Bühler has customers in every segment — ranging from local milling or brewing companies importing for their own production companies, up to global active multinationals such as Bunge and Cargill. In order to remain competitive in the marketplace, Bühler is not only continuously improving the design of its mechanical ship unloaders to provide the latest technological developments, but it also looks at long-term trends so that it can anticipate market demands. One of its latest developments has been a new Portalink with a longer boom, which makes it suitable for the increasingly large vessels used in today’s bulk market. SOPHISTICATION, NOT COMPLEXITY: DESIGNING RELIABILITY INTO DOCKSOLID HANDLING EQUIPMENT Buttimer Group has been working with clients to bring greater ease of use and peace of mind to ports and terminals operating with wheel-mounted, rail-mounted and static bulk loading hoppers. DOCKSOLID hoppers — the latest evolution of Buttimer’s bulk port equipment range — are built for reliability, efficiency and consistency: the units are an increasingly sophisticated ship unloading option, incorporating the latest dust control and environmental safety technology. Unlike many unloading solutions, however, DOCKSOLID equipment is also designed for ease of maintenance, longevity and simplicity of mechanics. The trend towards increased computerization, complex electronics and manufacturer exclusive spare parts worries many operators: if a problem arises, the terminal can be left without its ship-unloading system for a number of days or longer. Particularly in high-throughput or remote terminals, non-availability of equipment can be hugely costly, and where the problem cannot be easily repaired, a disaster for the port operator. DOCKSOLID bulk handling equipment is engineered to be extremely reliable, both in its mechanics and the strength of its structure, and does not rely on overly complex software or electronic elements. Bulk terminals can be demanding and wearing environments — be it harsh climactic conditions, overloading or abuse of equipment, abrasive bulk products — and so DOCKSOLID equipment is designed to be easily maintained and repaired on-site, by an experienced mechanical engineer, anywhere in the world. Bulk terminals simply cannot afford to have equipment out of action and so, to be ‘fit-for- purpose’, bulk handling equipment needs to be both robust and reliable. In May 2014, two DOCKSOLID units were designed and built in Tipperary, Ireland and shipped from the Port of Cork for ABP (Associated British Ports). The units are being used for the unloading of wood-pellet biomass at the Port of Hull, and adapt a number of key innovations to the client’s requirements; they are the first Buttimer units under the new DOCKSOLID brand. The hoppers for ABP have a throughput capacity of between 500–600tph (tonnes per hour) and were designed for use with a 12m3 grab size. They have a capacity of 65m3 under the grid (107m3 water capacity), and each unit’s total weight is 101 tonnes. The hopper’s bespoke steering mechanism gives these units a tight turning radius on their outer driving wheel of 16.3 metres. Buttimer worked with ABP on the details of the design of the two hoppers, in order to match them with the port operator’s process and personnel. The hopper’s operating cabin’s position was raised for clearer viewing of the loading spout, and a camera system was installed to aid the operator’s monitoring. The operator’s cabin includes air-conditioning and the two loading chutes are operated via joysticks in the operator’s armrests. Motors and equipment are operated through a HMI touch screen control. In order to minimize dust congestion, the machinery plant-room is supplied with filtered air and kept at a positive air pressure, there are also carbon monoxide and nitrogen oxide sensors installed, and a gas deluge fire prevention system. Buttimer Group has been producing bulk port equipment for over a decade and has designed, fabricated and delivered units operating in Ireland, the UK, Europe and Africa. The DOCKSOLID brand was introduced in 2014 to clarify core design features and strengths in the international marketplace. The core attributes are cutting edge dust and environmental controls, manoeuvrability and versatility, as well as strong their structural design. The new brand’s tagline is thus: Clean. Flexible. Robust. DOCKSOLID hoppers are engineered to reduce the loss of product — and environmental contamination — through dust emitted from dry bulk commodities during the loading process. Design elements such as a wind-block loading thimble above the grid, a flex-flap dust retention system under the grid and highly efficient extractor filters around the hopper’s opening are used for retaining, removing or re-introducing emitted dust particles to the bulk commodity. The self-drive mobile hoppers are powered by a highly-efficient engine, located in a sealed control cubicle, designed to minimize CO2 emissions, wear and tear on the engine, and noise pollution. The patented wheel system designed for DOCKSOLID hoppers allows mobile units remarkable manoeuvrability — bringing versatility to multi-purpose ports. The bespoke steering system allows for an extremely tight turning radius and agile self- drive, even where quay space is highly constrained. The patented DOCKSOLID suspension system also ensures equipment easily handles uneven quay surfaces while driving or static, and maintains the balance of loads across pads on the ground surface, and on the hopper’s structure during loading — to ensure the units’ structural longevity and protection of the quay surface. Handling bulk products exerts complex loads on a hopper's structure. Far too many loading hoppers get damaged or broken due to poorly engineered structures and frames. Ports can be harsh environments and so DOCKSOLID equipment is designed to be robust, reliable and available for 24-hour use. Various designs of ship and barge unloaders systems are available; some are specifically used for unloading of grains and oilseeds, others are used for all kind of granular products and some special ones are ideal for the unloading of non-easy flowing products. shore based units, which can be stationary or fixed. o mechanical units, which elevate the product mass by means of a chain, a screw, or a belt with or without buckets. The selection of a particular system mainly depends on the type of vessel to be unloaded, hourly capacity and the properties of the products to be handled. Aspects as environment, product loss, contamination and degradation during handling operations may also be put in consideration. The best known discontinuous unloader is the grab, capable of handling vessels of all shapes and sizes. They have gained worldwide acceptance as flexible, reliable and versatile items of equipment for the handling of a wide variety of bulk commodities and almost all dry granular products, including all grains, oilseeds and by-products. Powders cause more problems than granular products and need care and special grabs to minimize leakage and spillage. The major advantage of a grab unloader over other types of unloading equipment is its familiarity and proven ability as grabs are a flexible, robust, simple to handle and relatively easy to maintain. The fixed slewing tower or column type grab unloader can reach the whole hatch area from one position. Conventional column cranes will take grabs of up to 30 tonnes and gantry unloader cranes will take high capacity grabs from 30 tonnes up to about 85 tonnes. Bulldozer and front wheel loader assistance is required for cleaning-up and for bringing the product from the ‘dead corners’ under the deck overhang to within the reach of the grab. Feeding should keep pace with grab unloading. Grab unloaders incorporate a hopper that feeds the bulk materials direct to a conveyor belt system or to a truck. The hoppers can be equipped with spraying devices or suction systems to minimize dust emissions. The nominal unloading rate of a grab unloader is determined by the achieved number of handling cycles per hour multiplied by the average grab load. Grab unloading always starts with a peak performance with optimum digging conditions and short hoist distances, and finishes with very low performance when trimming and cleaning the remaining cargo out of the hold. Co-ordinating the movements of grab and front loaders needs operator skill and close attention. It is a batch type operation. The shuttling of the bucket between the ship’s hatch and the land-based hopper occupy most of the cycle time. A certain amount of product spillage and loss is almost inevitable along the grab travel, making dust pollution a problem that can be controlled but not easily eliminated. Despite all these circumstances, grab unloaders still have not been superseded by continuous methods of unloading, they co-exist. The type and potential of the grab depends on the crane capacity and upon the product to be handled. The closing time should be short, but a grab that closes too quickly may pick-up less than its maximum load. Overfilling should be avoided as this generates spillage and leaking lips. unloading must be closely co-ordinated with the load in systems of the port terminal. In order to cover this wide range of requirements,TMSA conceived a fix grab unloading system and has representations and partnerships of different technologies for discontinuous and continuous unloading systems. A recognized problem of operating grab unloaders is that it may generate a lot of dust. Dust is generated each time the product is moved or discharged and, wind can make matters worse. The most important instances of dust generation during the grab cycle are just after digging and during discharge into the receiving surge hopper. Foreign objects may prevent the grab from closing fully and additional spillage occurs as the bucket travels from ship to hopper. The aspirated hoppers have extraction systems which guarantee a maximum result. The grab is lowered into a double wall casing, maintaining an air current in the direction of the product flow. During operation, the grab is enclosed in a casing, to eliminate wind effects. The dust generated during the discharge of the grab is aspirated by a well-designed dust control system installed between the hopper walls. TMSA searches for the best-cost proposal selecting specifications, based on its long and rich experience as a port terminal specialist that meet the client’s requirements of performance and reliability — all this is weighed against not only the capital costs but also the operational costs of the project. Absam, France: surface truck unloading unit and the Manutube, an enclosed belt conveyor with a belt sliding inside a plastic tube with no idlers, fully enclosed. Ravestein, the Netherlands: a shipyard and construction company, specialized in building bridges, modular loading quays as well as design and construction of crane and shiploader/unloader pontoons which substitute the conventional concrete pier avoiding long term civil works. TMSA offers different solutions for the conveying of bulk material. Its wide technological portfolio includes belt conveyors that can be open, covered or enclosed, such as the RopeCon system, pipe conveyors, overland conveyors or conventional trough conveyor belts with high capacities, up to 20,000tph. TMSA has the knowledge and experience for the proper selection of a shiploader/shipunloader and conveying system which will fit the needs and budget of each project. A ship at sea is earning its owners money; a ship in port is costing its owners money. Therefore, rapid loading and unloading are critical to the success of a shipping company and dockside technology continues to develop to provide ever more speed and efficiency. Unloading dry bulk cargo from ships would be slow, laborious and potentially dangerous if it had to be done manually. But for many years the process has been automated and ship-unloaders are a well-developed technology that work continuously to reliably and efficiently transfer grains, minerals and other dry bulk materials from ship to shore. Unloaders come in a number of different designs, each suited to different materials. The core technologies include bucket wheels, flighted vertical conveyors, augers, horizontal belt conveyors and pneumatic systems. The mechanical principles of each of these are self-explanatory, but it is essential that control and monitoring is maintained at all times to both ensure trouble- free operation and to calculate the weight of cargo being unloaded. An emerging technology that is increasingly being integrated into unloaders is wireless, non-contact digital torque monitoring. This measures the work being done by the motors and drive shafts of the unloaders and the data is automatically and instantly converted into cargo weight figures. Unloaders need to run at optimum speed to minimize ship turnaround times, while also controlling the rate of delivery of materials to the dockside facilities. Real-time data from the unloaders is collected by having sensors monitoring the critical variables — in this case the torque on the drive shafts, the speed of the motors and the drive power — and fed back to the control system. 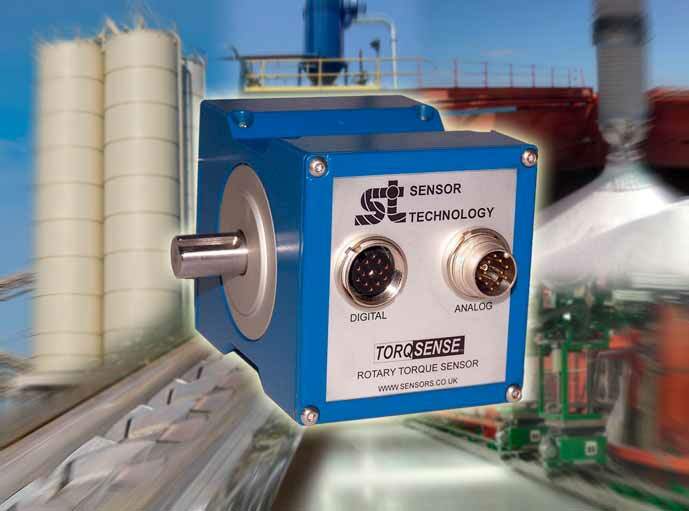 “TorqSense measurement together with the digital outputs it offers is often the only practical way to measure torque in an industrial environment. And once you are collecting torque data this way, you are well on the way to sophisticated real-time control of complex process,” says Ingham. This innovative method of measuring torque is bringing distinct advantages to handling dry bulk products. A process that was once regarded as very difficult to monitor can now reap the same benefits as many other industrial processes, enabling operations to be optimized for the highest levels of productivity with the lowest cost. Sensor Technology has also adapted the SAW technique for use with straight-line load monitoring, such as is required by cranes and hoists as they lift cargo to and from ships. This means that all cargo handling techniques used in any given situation can be monitored by the same system, which will lead to significant savings in management time and costs as two or more reports do not have to be integrated.